The best organizations attract and reward top talent by offering paths for advancement. Too often, though, individual contributors transition to frontline management roles without development and support. Your frontline managers are expert operators, but can they lead? In a study by Harvard Business Review, 77% of executives agreed that frontline managers play a critical role in reaching their organizational goals. Surprisingly, only 33% stated that their organization’s frontline managers display competent decision-making, and a mere 12% reported their organizations invest sufficiently in developing their frontline managers. 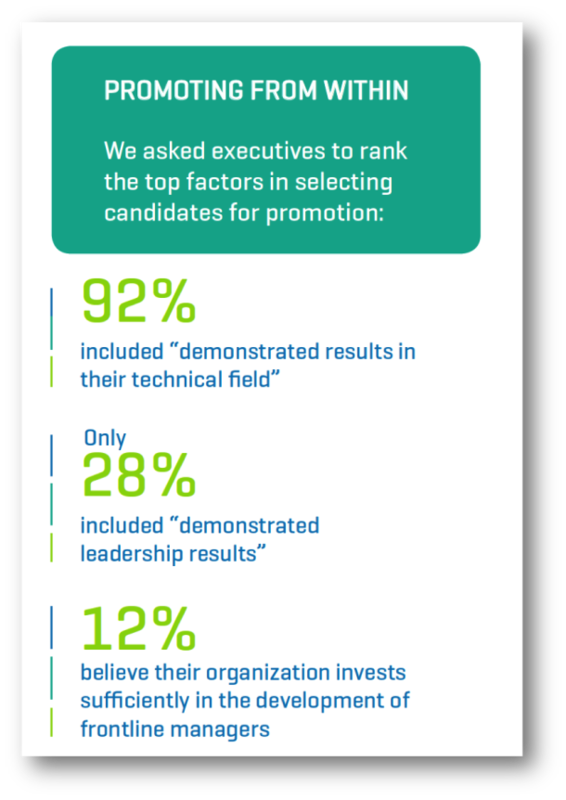 In addition, an astounding 90 percent believed frontline managers’ lack of leadership development negatively impacts employee engagement results. At Performex, we developed a program to address the unique leadership challenges faced by frontline managers. With an emphasis on building communication, coaching and engagement skills, we equip frontline managers for success as they begin leading others, including their former peers. The program includes a 2-day immersion workshop for the frontline managers and also includes a 1-day coaching workshop for their managers. Those supervising the frontline team reinforce their development goals with ongoing coaching. Each manager will complete a self-assessment to identify his/her strengths and development challenges. Upon completion of the program, each participant will have created a personal development plan with clear objectives and action items to develop in one key leadership area. Through the program, participants will become outstanding coaches, building their coaching skills through team exercises. As handling difficult discussion with former peers is a very common challenge for frontline managers promoted from hourly positions, each manager will develop a comprehensive coaching plan for handling the most difficult discussing he/she faces in the workplace. Organizations may support the Frontline Leadership Program with an investment in a 1-day coaching workshop for the frontline management team’s supervisors. As expert coaches, Middle Managers will provide ongoing coaching and support to reinforce the Frontline Managers’ development plans. The result? Improved retention, engagement and business performance. Interested in learning more? Contact us today to discuss a development plan for your frontline managers.